The campsite restaurant Les Myrtilles is located in the heart of a natural park, in the forest of Saint Nicolas des Biefs in the Allier, the ideal place for peaceful holidays in the nature ! The campsite also has an official certification as a stop on the hiking and mountain biking trails. A complete change of scenery guaranteed, unforgettable walks in an outstanding natural environment, and385 kms of marked paths. Hikers, cyclists, riders, skiers, fishermen…, everyone can enjoy here his favorite hobby. In winter, the largest ski area of Monts de la Madeleine in the Bourbonnaise forest awaits you. Saint Nicolas des Biefs is the higher village of the Allier : located at 930 meters above the sea level. The Plateau de la Verrerie ( ranged Natura 2000 ) and its beech trees pathway are must-see sights. We can still find in the diversion bays ( small streams crossing the fields ) glass shards of several hundreds years. More informations : 04 70 56 49 15. 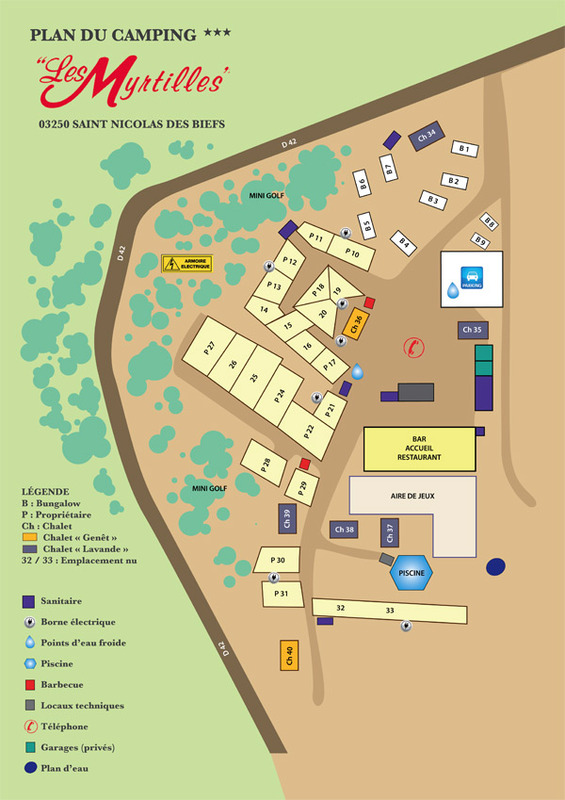 At Saint Nicolas, there is a micro brewery « Saint Nicolas Da Bière » who offers a tasting and a sale of its products. Remember to call before going to make sure that Nicolas will be there to receive you. Phone. 06 42 95 70 58. Musée des verriers de Saint Nicolas des Biefs. In this museum you will learn the story of Saint Nicolas glassmakers who who spent several decades in “ la Verrerie “ and some beautiful pieces of glassware. La Ferme aux Cabris invites you to discover its goat breeding doing some activities with animals. In Saint-Clément, the leisure park offers different activities on the lake or around like a tree top adventure for exemple. Buffalo breeding and meat tasting. Le Moulin Goutaudier, in Saint Nicolas district invites you to discover its trout breeding and to fish your meal if you wish. Do not forget to spend a day at Vulcania, an theme park on volcanoes and sciences. and many other sites to discover,… brochure at the reception. An optical phenomenon related with the shape of the landscape gives you the impression that the road goes down when it goes up ! If you want to have fun thinking you are Einstein, bring some rolling objects with you ! The leisure park at the bottom of the Renaison Dams near Roanne offers a mini golf an outside bowling, donkey rides..and a shaded terrace where you can have an ice cream or a drink. In Arfeuille, the Barbenan river turns to several waterfalls including the Pisserote waterfall. It’s better to go there with good weather conditions. Several paths take you there, from a 40 minutes to 3 hours walk. A Chatel-Montagne, is a small village located about 12 kilometers from the campsite, where you can visit a wonderful 11th century Romanesque church, the heritage house offering exhibitions throughout the year and meet some arts craftsmen. Saint-Jean-Saint-Maurice sur Loire, awarded “ village de caractère “, invites you to stroll in its picturesque narrow streets. Unique panoramic views on the Loire ! Aux Cimes de Bécajat , is a tree top adventure park near Roanne in the Loire. Le Pal is a theme park and a wildlife park, located in the heart on Auvergne ideal for family entertainment. In Saint Rirand, in a place called Bécajat you will find another tree top adventure and a buffalo farm. Phone: 04 77 65 76 88. There is also a nice outdoor pool, Phone: 04 70 41 06 33. And on monday morning the traditional market. In Lavoine, a charming little village with several walking trails, a water sawmill, the wood and forest house and a magnificent water time machine almost unique in the world. In Lapalisse, located about 40 km from the campsite, you can visit the beautiful castle of Jacques II de Chabanne where a light and sound show is organized some evenings. Informations : www.spectacle-lapalisse.com. The town of Lapalisse is located on the famous national road 7 and organizes reconstructions of traffic jams with vintage cars and dressed up people. In Vichy and Cusset about 45 km from the campsite, you can find all kind of shops and some places to visit like the underground museum of Cusset, thermal establishments, springs, parks, the opera in Vichy…). tourist office of Vichy : 0 825 77 10 10. In Dompierre sur Besbre, you can enjoy a day in the theme and wildlife park : Le Pal is the first french theme park ! Thrills for some and relaxing for other watching the animals. Nearby, discover the castle of La Roche overlooking the Loire. Roanne is an old industrial city. You can find there the fine arts and archeology Déchelette Museum, a theater, several typical churches and a yacht harbour on the Loire. It has also a swimming pool and a ice rink. The gastronomic specialty of Roanne is the Praluline, a brioche with pralines made by the famous chocolatier François Pralus ( always imitated and never equaled ! ). To taste absolutely (Pralus shop at the Renaison halls). Clermont-Ferrand its Michelin factories and museum. The Michelin adventure in family ! The CNCS : National Center of Stage Costume presents a permanent exhibition about Nureyev and several temporary exhibitions throughout the year. Informations : 04 70 20 76 20.